Click here to open the Live Worksheets Maker. Then choose a doc, docx, pdf, jpg or png file from your computer and click upload. Wait until your worksheet appears on the screen. Click, hold and drag to draw text boxes. 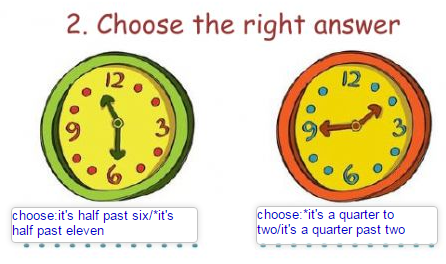 Write the right answers in the text boxes. If there are multiple possible answers, enter all them, separated with bars. Click the preview button to see your live worksheet in action and check it. If you like the result, click the save button. Then you just have to enter a title, your username and your password. You'll get the link to your new interactive worksheet inmediately. If you want, you can share your interactive worksheet with other users. You'll have to enter the title, language, level, subject, age, description and content of your worksheet. This information will help others to find your worksheet. If you are not happy with your worksheet, click the discard button to upload a new one. You can offer a list of options for your students to choose from. Just draw a text box and enter "choose:" followed by the options separated with bars. In this case you must enter an asterisk before the right answer. 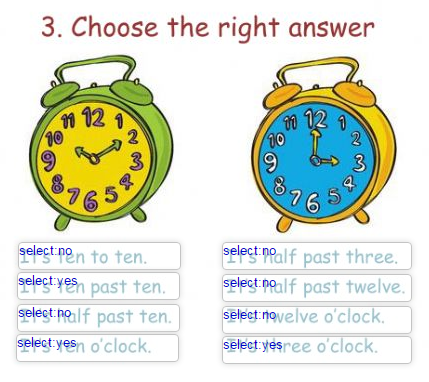 Just enter "select:yes" on the right answer, and "select:no" on the wrong answer(s). If you want to add check boxes, just add "tick:yes" before the right answers and "tick:no" before the wrong answers. 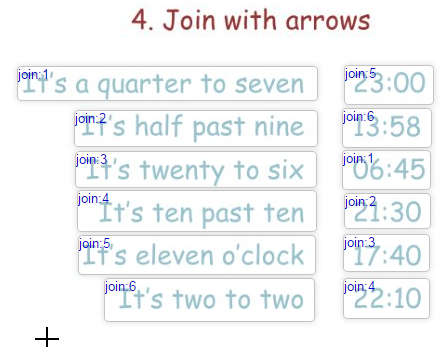 Enter "join:" followed by the same number on the answers that should be joined with an arrow. The numbers mustn't be repeated. Enter "drag:" followed by a number on the element that must be dragged, and "drop" followed by the same number on the place where it should go. Enter "listen:" followed by the text. Afterwards you'll be asked for the language of the text. At the moment, the listening exercises only work in Safari and Chrome. If you want to add a word search puzzle, draw a textbox and write "wordsearch". Then enter the number of rows and columns and your wordsearch will appear. Adjust the size if neccesary and click on the words. Enter "speak:" followed by the answer. Afterwards you'll be asked for the language. If there are multiple possible answers, enter all them, separated with bars. At the moment, the speaking exercises only work in Google Chrome. If your worksheet includes an open-answer question, you can insert a blank textbox for the answer. Of course, automatic correction will not work in this case. If you want to add an mp3 file, just draw a textbox and enter "playmp3:". Then you'll be asked to upload your file. If you want to add a video from youtube, just draw a big textbox and enter the video URL. If you want to add a link to another web page, just draw a textbox and enter "link:" followed by the URL. This will generate a clickable link which opens a link in a new window. Then click. The box must get blue. Then click and drag to move the textbox. You can also click on the center to select the box and then use the arrows in your keyboard to move it. Then click and drag to resize the textbox. You can also click on the center to select the box and then press Ctrl key + the arrows in your keyboard to resize it. This is very useful to make many boxes of the same size. Just click on the center of the box to select it, and then press Ctrl + C to copy and Ctrl + V to paste. To delete a textbox, click on the center to select it, and then press "delete" on your keyboard. Just press Ctrl + Z to undo the last change, and Ctrl + Y to redo the last change. Choose any worksheet from our shared collection and click on "How was it made?". You'll see it's very easy.